In the early 1890's, German speaking Lutherans moved to Pratt County. Approximately six Lutheran families homesteaded in the Natrona area prior to 1900. They gathered together in their homes for church services. Later they started meeting regularly at the Bunker Hill school house two miles northeast of Natrona. Pastor Brauer of Ellinwood and Pastors Lil and Degner of Plevna traveled by horse and buggy to serve this mission station. In August 1900, St. Paul's Evangelical Lutheran Church at Natrona was officially organized. 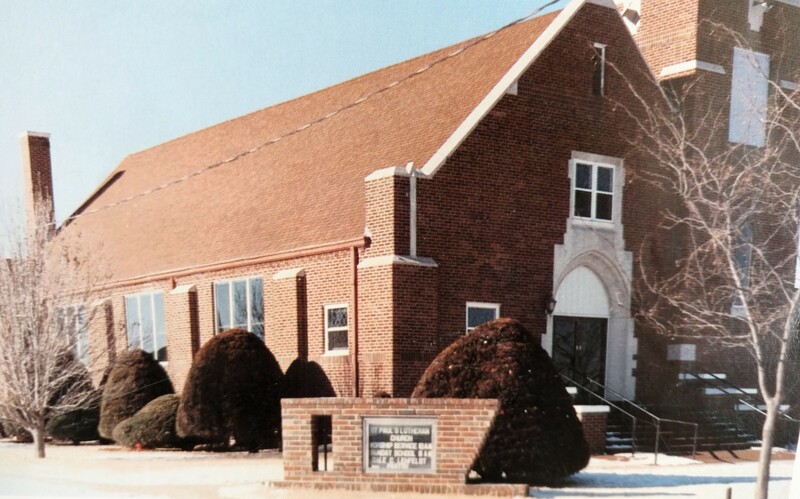 A constitution was drawn up in German and was signed by six charter voting men of the newly formed Evangelical Lutheran congregation of St. Paul’s in Natrona, Pratt County, Kansas. The six original signatures were William J. Jorns, Herman Hoeme, Julius Hoeme, W. H. Luders, Otto Gaedike and Ernst Hoeme. They chose Natrona as the location of the church because the train made regular stops at the Natrona depot which made it convenient for people from Pratt and Preston to attend church. A small, one room frame church was built and dedicated May 12, 1901. At this service, William A. Jorns, son of charter member Wm. J. Jorns was baptized. In September 1902, bids were taken for a parsonage, a barn and a pump for the cost of $956.66. In 1908, an addition and steeple with a church bell were built. The entrance was in the tower and as was customary at that time, the men went to the left for their seats and the women to the right. A small parochial school building was south of the church. The first resident pastor was Rev. A.G. Degner followed by Rev. Otto Zeschin, Rev. E.R. Tonn, Rev. Wm. Knoke, Rev. Wm. F. Hilst, Rev. Leo J. Fenske, Rev. G.O. Miessler, Rev. E.J. Harmon, Rev. Tom Kent, and Rev. Dale Lehfelt. Mr. Arlo Lehman served as Director of Christian Education. In 1925, the congrega tion recognized a need for a larger church. They decided to move the original church to the west and remodel it into a two-room school. A new brick church was constructed on the site of the original church at a total cost of $30,000. This church was dedicated on December 18, 1927. Bertha Studer and Raymond Starrett had the first wedding and Leo Seidel was the first to be baptized. A new pipe organ was purchased in 1935.